Demetrius Scott is a middle child of three, born and raised in Detroit, MI. He is a graduate of Michigan State University (MSU) where he received both his Bachelors and Master’s degree in accounting. Throughout his tenure at MSU, he was heavily involved in the community and around campus with various student organizations, such as NABA and mentoring programs. Demetrius has been actively involved in NABA since the day he stepped on campus, taking on various leadership roles including 2 years as chapter president and 1.5 years as Graduate advisor. 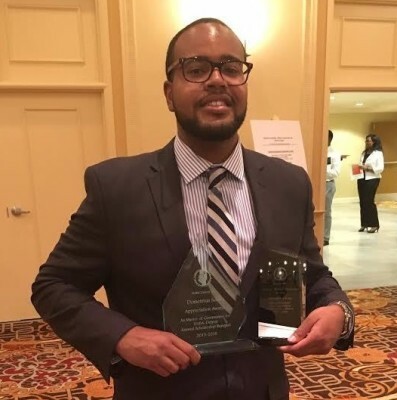 Upon graduation, Demetrius started his career with PwC where he worked as an audit professional for 3 years, focusing on audits of both public and private fortune 500 clients. During his time at PwC Demetrius was heavily involved in the firm’s diversity and inclusion initiatives and co-lead an internship program for high-performing minority students. Demetrius recently left PwC and now works as a Financial Analyst in the Treasury Finance department with Ally Financial. His current role entails preparing quarterly and year-end financial statements, as well as a variety or other monthly accounting functions. Outside of work, Demetrius has continued to stay active with the professional chapter of NABA, serving as the chapter Vice President for the past and upcoming fiscal year. Consistent with NABA’s motto “Lifting As We Climb”, Demetrius devotes a lot of his time to his passion of youth development by serving as a mentor for The Midnight Golf Program.